The Australian Prime Minister flies the Australian National Flag as the car flag. The International Flag Book in Color (Pedersen, Edited in the English language by Lt. Commander J. Bedells) published in 1971 notes that there is a "Prime Minister's Flag" for Australia. It notes that the flag was adopted in 1966 as a "special flag for the Head of the Australian Head of Government". No illustration was accompanied, however the flag was described a having the "full state coat of arms in the center of the lower part of the flag, between the Commonwealth Star and the Southern Cross". This image is what the flag with the design of the arms in the 1971 book would look like. "Australia recently became one of the very few countries with a head of government's flag (not to be confused with the head of state's flag). The Prime Minister now displays on his cars and aircraft when on official visits a personal standard. This consists of the Australian national flag (Australian Blue Ensign) with the coat of arms of Australia, including crest, motto, supporters, and wattle branches, in colour. The arms are placed in the center of the lower half of the flag between the "Commonwealth Star" and the Southern Cross." This report would be consistent with such a flag having been adopted by Prime Minister Harold Holt, who had become Prime Minister of Australia in January 1966, succeeding Sir Robert Menzies who had been Prime Minister for 16 years from 1949 (and also for two years from 1939). The Holt government significantly increased Australia's involvement in the Vietnam War and he visited the United States in June 1966. Adoption of a personal "rank" flag would have been consistent with a new Prime Minister during a period of increasing involvement in war. I personally have never seen this flag (though I have looked for it for over 30 years), nor found any archival support for the existence of the flag. If it was used, then its use probably was discontinued in December 1972 when the Liberal-Country Party coalition lost government to the Australian Labor Party's Gough Whitlam. Miles may be correct in his assertion that the flag never existed, but the credible report by Whitney Smith suggests that it may have existed for a short period 1966-1972. The illustration accompanying Mr Bhola's message is in error in that the Australian Coat of Arms rests on a spray of wattle, not a green compartment; and the scroll with the motto "Australia" is not the usual shape. "In 1966 a special Prime Minister's flag was proposed and some samples were made. This flag was made up of the Australian National Flag with the Australian Coat-of-Arms between the large seven-pointed star and the representation of the Southern Cross. However, this flag has not been officially adopted. Subsequent Prime Ministers have all supported a policy that the Australian National Flag should never be defaced by any other emblem, and each has stated that the Australian National Flag only should be used on his car or on other occasions." As this information may not have been available in 1971 when Christian Pedersen's book was published, his statement was soundly based. Miles Li is just pointing out that this flag has never formally existed. In the National Archives of Australia collection, at file item barcode 224899 is an unexplained 1938 drawing of a flag of this description (proposal?) entitled Government House Yarralumla - flag. Sir Robert Menzies also used car flags that were Australian National Flags defaced with the Coat of Arms throughout his time as Prime Minister, although very crude and roughly detailed. One is discussed and shown in file item barcode 1863037 at pages 90, and 121-124. In July 1958 the Prime Minister's Department investigated this flag and found that 'the closest enquiries throw no light whatsoever on the origins of this car pennant'. They can be seen in film footage and photographs of Menzies' cars, from his swearing-in as Prime Minister on 19 December 1949 and into the 1960s. Presumably they remained in use until Menzies retired on 26 January 1966. The drawing labelled Government House - Yarralumla is filed with date 1938, in a series with architectural plans for the city of Canberra. I'm not sure why such a flag was associated with the Governor-General's residence, but the current GG's flag (following Canada and New Zealand) was adopted in 1936, so there's a small chance this was an alternative suggestion. The pictures of the car flags accompany 1958 notes on a proposed policy of non-defacement of the national flag, although there were comments that it wouldn't apply to established flags such as the Customs flag, but don't seem to explain why the PM's flag would still be in use 8 years later. The ABC Television show "Auction Room" of 11 November 2012 included the sale of a car flag that was used by Prime Minister Menzies in the early 1950s. The flag had belonged to a former government driver. 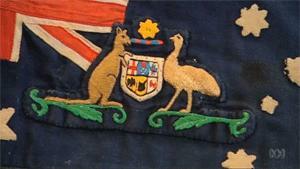 Attached is a screen capture image of the embroidered coat of arms on the Australian flag. This is the first time that I have seen an illustration of this Prime Ministerial car flag. Robert Menzies was Prime Minister (for the second time) from 19 December 1949 to 26 January 1966 and these Coat-of-Arms car flags were flown throughout most if not all of that time. One was seen on Menzies' Commonwealth car at the Opening of Parliament in 1950. From a pamphlet, " The Thistle Banner of Sir Robert Menzies" by Gregor Macaulay. Sir Robert Gordon Menzies KT AK CH PC QC (189401978), Prime Minister of Australia 1939-1941 and 1949-1966, is the only Australian to have been appointed a Knight of the Order of the Thistle (1963). He was granted arms by Lord Lyon in 1965 and his Thistle banner and crest, formerly displayed in St. Giles Cathedral, Edinburgh, are now in the Scots Church, Collins Street, Melbourne, where his state funeral was held. Sir Robert's arms are a considerable elaboration on the chiefly arms of Menzies of that Ilk (Argent, a chief Gules). 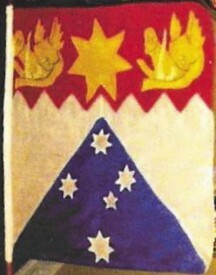 In the chief, the Commonwealth star from the crest and flag of Australia is flanked by two boars' heads for Gordon (Sir Robert's middle name - given in honour of Gordon of Khartoum), while the Southern Cross in the base is from the flag of Australia and the flag and arms of Victoria. This article appeared in The New Zealand Armorist No 149 Summer 2018-2019.